The Tarkovsky Quartet, as the name suggests, is inspired by the work of the late Russian film-maker and auteur, Andrei Tarkovsky. The group was founded by the pianist and composer, François Couturier, among much else, known for his work with the oud player, Anouar Brahem. Couturier had a background in classical music initially but developed a more improvisational style along the lines of Paul Bley, Chick Corea and Joachim Kühn, before engaging with the French free jazz movement. This album is the third by the quartet for ECM, followingNostalghia – Song for Tarkovsky (2005) and the eponymous Tarkovsky Quartet (2011). 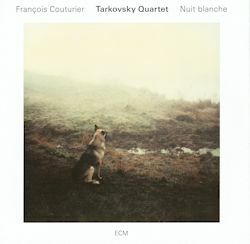 The solo album by Couturier in 2008, Un jour si blanc, is often associated with this sequence, too, however. The German cellist, Anja Lechner, part of the quartet, made a 2014 disc as a duo with Couturier, Moderato Cantabile. She is a musician at ease with different genres and can perform with equal facility, whatever the setting. This latest album contains no less than eight brief improvisations/compositions by the group members, half a dozen pieces written by Couturier and one where he shares the credits with soprano saxophonist, Jean-Marc Larché. In addition, there is a track featuring a work by Vivaldi, and a further anonymous piece from the Renaissance period. Dreams are a prominent theme of the disc. My difficulty lies with classifying the spontaneous group improvisations, namely Rêve, Rêve II, Dream III, Dream IV,Vertigo, Traum V, Traum VI and Rêve étrange. They seemed to me, to possess more of the flavour of experimental contemporary music than of jazz, neither did I find them particularly accessible. Courturier's compositions, by way of contrast, have an interesting, almost hypnotic, quality about them (check out, for instance, Soleil Sous La Pluie, Fantasia and Urga). Urga is far and away the longest track on the album, at over eleven minutes, and features fine contributions from violoncello, soprano sax and accordion. Couturier's Daydream illustrates some of his quality on solo piano. The title track, Nuit Blanche, is solemn, mysterious and haunting with Lechner sublime on violoncello and Matinier and Larché not far behind, on accordion and soprano sax respectively. Yet it is the group arrangement of Vivaldi'sCum dederit delectus suis somnum (from his sacred work Nisi Dominus) that most appeals, with each musician impressing. As for Quant ien congneu a ma pensee, this anonymous composition from the fifteenth century, also proves to be a standout track, stately, beautiful and rich in melody. Spontaneity and improvisation are of the essence of jazz and undoubtedly those qualities are to be found here. As Carolin Emcke points out in the informative liner notes, so is 'the special alertness that comes from listening to each other' and the musicians clearly possess that kind of sensitivity and empathy. Was I appreciating the album as jazz or simply as good music? Other listeners may have the same dilemma and will differ as to how far that matters.